'Auld Lang Syne': What Does it Mean Again? Here it is. 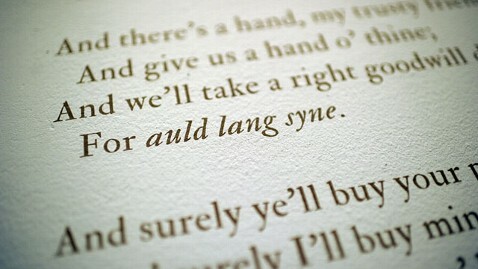 The answer to a perennial question of what on earth does "Auld Lang Syne" mean? The confusion over the song is arguably almost as much of a tradition as the song itself. As revelers stumble and mumble through the verses-singing the "auld lang syne" part much louder than the rest of the song because it's really the only part people know-someone always asks what the words mean. The title of the Scottish tune translates to "times gone by" and is about remembering friends from the past and not letting them be forgotten. Despite its strong association with New Year's Eve, "Auld Lang Syne," written by Robert Burns in the 1700s, was never intended to be a holiday song. Guy Lombardo is credited with popularizing the song when his band used it as a segue between two radio programs during a live performance at the Roosevelt Hotel in New York in 1929. By coincidence, they played "Auld Lang Syne" just after the clock hit midnight, and a New Year's tradition was born. The song, and the confusion that comes with it, has been immortalized in countless movies and TV shows. In "When Harry Met Sally," Billy Crystal's baffled Harry wonders, "What does this song mean? My whole life, I don't know what this song means. I mean, 'Should old acquaintance be forgot?' Does that mean that we should forget old acquaintances. Or does it mean that if we happened to forget them, we should remember them, which is not possible because we already forgot them?" "Well, maybe it just means that we should remember that we forgot them or something," Sally reasons. "Anyway, it's about old friends." So as you surround yourself with friends old and new tonight, sing on. Should old acquaintance be forgot, and never brought to mind? Should old acquaintance be forgot, and auld lang syne? CHORUS: For auld lang syne, my dear, for auld lang syne, we'll take a cup of kindness yet, for auld lang syne. And surely you'll buy your pint cup and surely I'll buy mine! And we'll take a cup o' kindness yet, for auld lang syne. CHORUS We two have run about the slopes, and picked the daisies fine ; But we've wandered many a weary foot, since auld lang syne. CHORUS We two have paddled in the stream, from morning sun till dine; But seas between us broad have roared since auld lang syne. CHORUS And there's a hand my trusty friend ! And give us a hand o' thine ! And we'll take a right good-will draught, for auld lang syne.